*Original story available on WKU News. Please visit https://wkunews.wordpress.com/2015/05/07/irh-transit/ to be taken directly to the story. There is a new look to WKU’s Institute for Rural Health’s (IRH) outreach this spring semester. With the use of portable equipment, the IRH will use its new Ford Transit Connect to provide preventive medical and dental services, as well as health education in rural areas of the Commonwealth of Kentucky. In 2013-14 alone, the Mobile Health and Wellness Unit and the Mobile Dental Unit visited more than 114 locations in the WKU service area and served more than 4,320 patients. The units collectively provided 8,526 services in the community during the 2013-2014 academic year. With this new addition to the IRH fleet, the practitioners will be able to service the area more economically and efficiently during times when the facilities have indoor space for services. The mission of the IRH is to steward a high quality of life for rural populations and underserved areas by engaging students and faculty in service learning and research, by providing clinical services, and by serving as a global resource for improving health in rural communities. Learn more about the Institute for Rural Health’s outreach by visiting http://www.wku.edu/irh/. 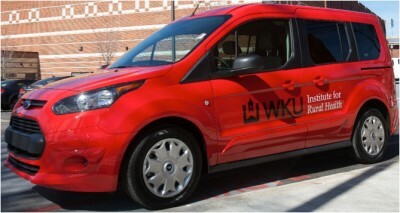 WKU’s Institute for Rural Health will use its new Ford Transit Connect to provide preventive medical and dental services, as well as health education in rural areas of the Commonwealth of Kentucky.